For a couple of years in the ‘90s I worked for a theatre at Lincoln State Park (www.indianasabelincoln.org) in southwestern Indiana that presented an annual summer musical, Young Abe Lincoln. Lincoln’s boyhood years in Indiana from ages 7 to 21 were full of sorrow – he lost his mother and his sister there; much of his lifelong melancholy has its roots there – but crowds could flock to the park on a summer night to watch that story being told in song and dance. The show was performed in a beautiful outdoor amphitheatre. On the drive to the theatre, one passed the churchyard where Lincoln’s sister, Sarah, is buried. Lincoln’s mother, Nancy, is buried across from the state park in what is now the Lincoln Boyhood National Memorial (nps.gov/libo). Young Abe Lincoln was sweet and charming and it played fast and loose with the history. One rejected marketing pitch for Young Abe Lincoln was “Walk in Lincoln’s Shoes by Day, Dance in Them at Night!” It wasn’t used but it made me smile. The mythology and biography of Abraham Lincoln is in constant revision. In a timely discussion of unpopular U.S. Presidents not long ago, I mentioned that Abraham Lincoln was so disliked in many quarters that there were those who did not think he would live through his first inauguration. Such is the filter of time on history. Even though Lincoln is almost universally revered and practically deified today, he was widely reviled by many Southerners and Northerners alike when he assumed the presidency in 1861. Of course some were so fearful of his presidency that there was mass secession and civil war. Even so, as an elementary school student in a still all-white public school in Birmingham during the height of the civil rights movement and the centennial of the American Civil War, my history lessons presented Lincoln as the epitome of goodness – loved and revered by all, the Great Emancipator, the man who brought unity from division. He was the leader of the northern troops during a bloody civil war but my southern teachers, in teaching that war, always painted Lincoln in a beatific light. My parents were taught that same reverence for Lincoln in southern classrooms two decades before me. The dichotomy is not lost on me. Lincoln has been a popular persona of American culture since his death, celebrated by artists from Walt Whitman’s sublime “O Captain! My Captain” to the ridiculous Seth Grahame-Smith novel Abraham Lincoln: Vampire Hunter and its subsequent film adaptation. Since the advent of film, it seems every generation produces a definitive biographical film about Lincoln. New Lincoln titles are added to book lists annually. Like most Americans, at least from Baby Boomers back, Lincoln’s life and legacy have been a constant. On my one and only trip to Springfield, Illinois, in the ‘90s, my only objective was to visit Lincoln’s tomb. On a recent visit to Lexington, Kentucky, I found myself stumbling across places that had relevance to Mary Todd Lincoln’s early life even though I wasn’t necessarily looking for them. Several birthdays ago, I received Angels and Ages: A Short Book about Darwin, Lincoln, and Modern Life by Adam Gopnik (Alfred A. Knopf, 2009) as a gift to commemorate the bicentennial of Lincoln’s birth. Lincoln and Charles Darwin were born on the exact same day – February 12, 1809. Gopnik explores the profound impact those two distinct 19th century lives had on society and culture in the two centuries since their births. Now comes an extraordinary novel, Lincoln in the Bardo (Random House, 2017). 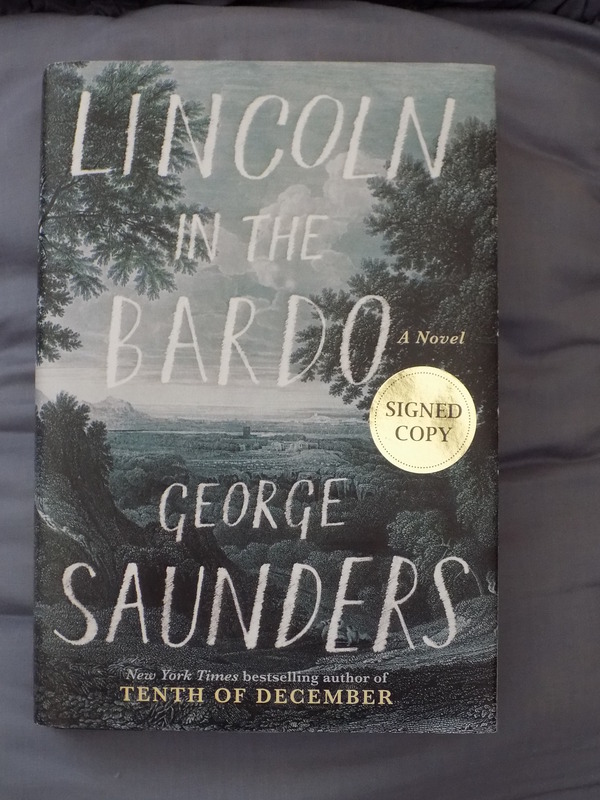 The title character of Lincoln in the Bardo, the first novel by George Saunders (who is already wildly acclaimed as a short story writer), is Willie Lincoln, not Abraham. Willie, Abraham and Mary Todd Lincoln’s third son, died at age 11 in 1862, barely a year into the War. It is known that, after Willie’s funeral, Lincoln travelled alone to the cemetery at night to be with his son’s body, to mourn and weep over him. That element of fact provides the impetus for Saunders’s highly entertaining choral meditation on death and grief. He uses the night of Willie’s burial as the material for a brilliantly compelling work of robust, complex, and unique fiction. Lincoln in the Bardo is hypnotic and hallucinogenic. The virtuosic structure combines real historical accounts with fictional historical accounts and, most intriguingly, a chorus of the voices of spirits whose bodies are laid to rest in the Oak Hill Cemetery in Georgetown where Willie has just been interred in a borrowed crypt. The “bardo” of the title is a liminal state – a concept in Tibetan Buddhism that refers to the transition from one life to the next. The spirits of Lincoln in the Bardo have, for a variety of reasons, not moved on and are in denial about their own deaths. They refer to their coffins as “sick-boxes” and, despite their supernatural abilities and extreme permutations, await the time when they might return to their normal earthly lives. I hesitate to divulge too much about Lincoln in the Bardo since it is best to encounter the book with a fresh eye. Suffice it to say that the novel begins with a poignant narrative about an unconsummated marriage and ends with a moment that is thrilling in its abrupt and surprising impact. In between are dozens of distinct voices that narrate the struggle for young Willie Lincoln’s soul, framed by historical documents providing further context for the political and emotional struggles of his father. Abraham Lincoln’s appearances in the book provide a hush and urgency to the turmoil of the night of Willie’s burial. Saunders captures Lincoln’s insurmountable grief through many eyes and illuminates the undependable nature of personal perception. In the course of the book, observers call Lincoln “The ugliest man I have ever put my eyes on” and “The homeliest man I ever saw.” A page later someone comments that “He never appeared ugly to me, for his face … had the stamp of intellectual beauty” and another adds that “neighbors told me that I would find Mr. Lincoln was an ugly man, when he is really the handsomest man I ever saw in my life.” Such contradictions abound in the historical testimony of the novel. Such moments of human and otherworldly cacophony make Lincoln in the Bardo a triumphant read despite its grim and often disturbing subject matter. I am not an aficionado of audiobooks but I am curious about this one. Each character is voiced by a different performer – 166 in all, including Don Cheadle, Julianne Moore, Susan Sarandon, David Sedaris, Ben Stiller, and George Saunders. I may have to listen to it. In fact, while reading the book, I kept envisioning it as a play or a staged reading event. Its theatricality is undeniable. Lincoln in the Bardo is certainly not typical summer reading fare and it’s definitely not going to be to everybody’s taste, but for an adventurous reader willing to tackle it, it’s easy to be quickly drawn into this original, magnificent, and challenging book. This entry was posted in Lincoln in the Bardo by George Saunders and tagged Abraham Lincoln, Angels and Ages by Adam Gopnik, bardo, Charles Darwin, George Saunders, Lincoln Boyhood National Memorial, Lincoln in the Bardo, Lincoln State Park Indiana, Mary Todd Lincoln, modern American novels, Willie Lincoln's death, Young Abe Lincoln musical on May 16, 2017 by gedwardjourney.